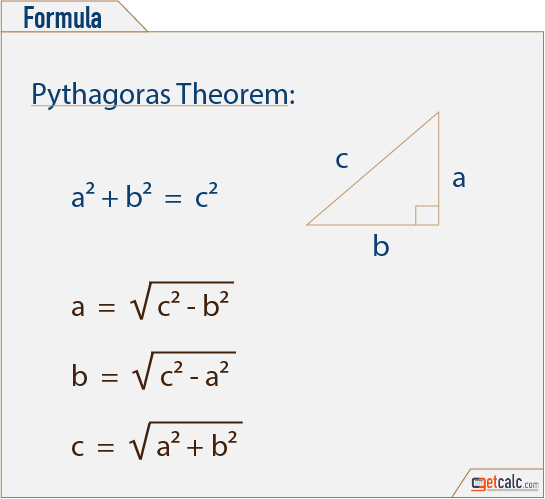 getcalc.com's Pythagorean Theorem Calculator is an online basic math function tool to find the side or hypotenuse of a right angle triangle in the Euclidean geometry. Pythagorean Theorem also known as Pythagoras's Theorem named is one of a basic mathemetic functions represents the relationship between the sides & hypotenuse of a right angle triangle. It states that the sum square of both sides equal to the square of hypotenuse (long side) of a triangle.